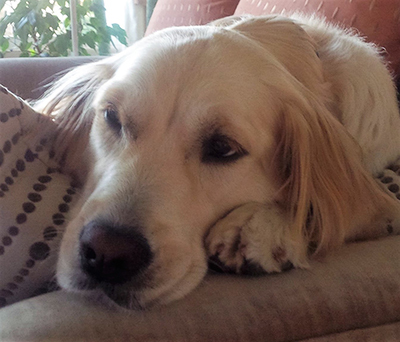 Tess was a one-and one-half year old Golden Retriever living outside at the home of a single mother who eventually decided she couldn’t take care of her. She was turned over to the Southern California Golden Retriever Rescue (SCGRR) where she was placed in a foster home until being adopted in 2014. 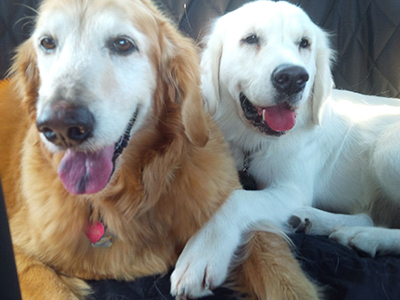 She immediately charmed her new family with her energy and friendly, playful personality and quickly engaged her adopted sister, 11-year-old Zelda. In August, just a few days shy of her third birthday and only 10 months after finding her new home, Tess was killed instantly while playing when she ran into the side of a moving car. Tess’ owners, Bill McIntyre and Patricia Low, were devastated. Fast forward a couple weeks and Bill and Pat find themselves on a two-day drive in a rental car from Texas to their Southeastern California home. In the back seat was Cinda. 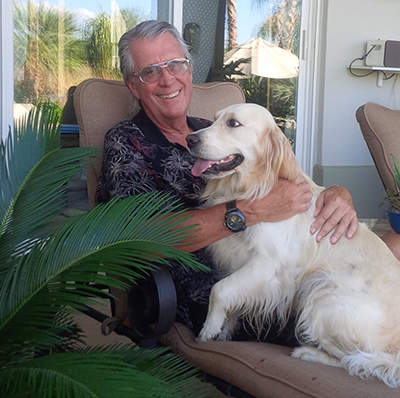 A pure bred English Cream Golden Retriever, Cinda was sold to a breeder at a young age. But when the breeder found out that Cinda had an inverted eyelash condition she was targeted as damaged goods and sent back to the original seller with her $4,000 price tag refunded. Cinda was literally put out to pasture. With no future in breeding she was never provided with the operation to fix her eyes that would save her from going blind. She was living in a backyard pen. Until Bill and Pat came to rescue her. She has now had her eyelash condition successfully corrected, has been spayed, and has taken her place alongside Zelda in her new home. But that doesn’t mean Tess has been forgotten. She is the inspiration for the Tess McIntyre Foundation. Bill and Pat consider Cinda to be the first beneficiary of the foundation. Another will be the SCGRR, the agency that rescued Tess and placed her in a stable home. The foundation is not a rescue organization in itself. Its goal is, instead, to provide funding for other qualified rescue services. Their first priority will be in helping organizations who are working with animals, like Cinda, who need medical attention in order to improve their chances of adoption and finding a home. The foundation, a 501(c)(3) non-profit which was started in August, recently launched its Web site where you can contact the foundation or make a donation. All of the money donated will go toward helping rescued animals, the only administrative costs being the fee charged for processing credit card donations. While they will never completely get over the shock of Tess’ accident, her owners are dedicating themselves to remembering her in a meaningful way by helping other needy dogs live a healthy life in a loving home.